Christmas is my favorite time of year, the entire house gets decorations, even bathrooms. This is the first Christmas that I've had my son who will be 3 months old for Christmas. I wasn't planning on completely redecorating his room, however this year we started a tradition of book advent calendar. 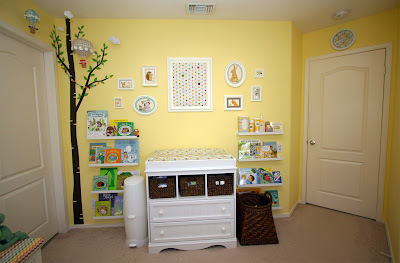 Since the nursery is mainly decorated with books, it seemed so natural to decorate the rest of the room to match. See how the nursery looks for the rest of the year. Like what you see and want it for yourself? Add holiday ribbon to your stuffed animals to give them a festive flare! Tie the ribbon into a bow or wrap it around the neck like a winter scarf. 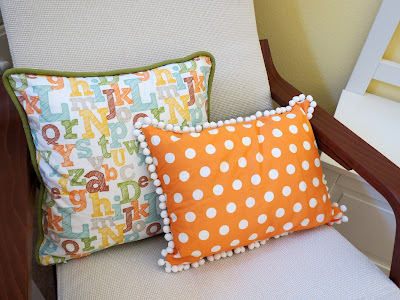 Wrap any picture frames with wrapping paper and bows. Its an easy way to instantly bring some holiday cheer into a room. 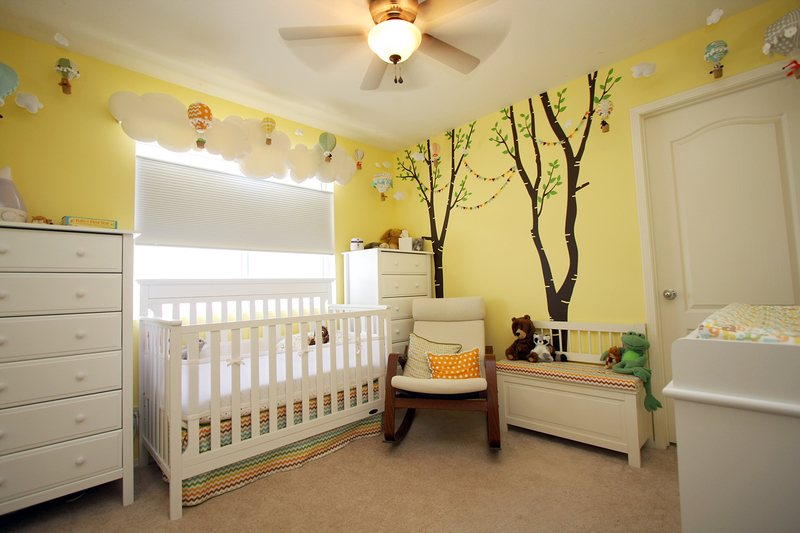 Replace any fabric items such as pillow cases, blankets, crib skirts and changing pad covers with Christmas themed ones. 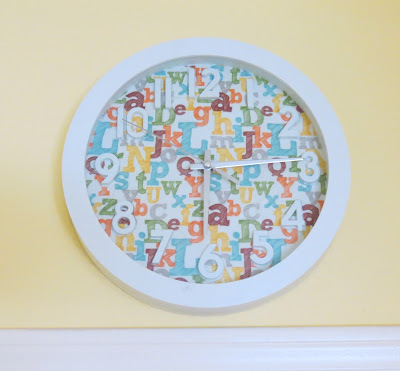 You can replace or cover a large frame with an advent calendar. You can find my Angel calendar at Fabric.com along with a lot of other designs. I made the Santa Suit changing pad cover from an apron panel I found in store at Hobby Lobby but you can find it online at Etsy. You have to piece the pockets into the arm hole area and find some red fabric to make up the difference, but it looks pretty good still! Place holiday wall decal or reusable stickers, the kind used on windows or sliding doors work well, on the wall. I got mine from a super Joann's in the seasonal section but they aren't available online. It had pine branches, which didn't match the nursery trees, so I just used the ornaments from 4 packages. Hang craft foam or paper snowflakes from the ceiling using Command Hooks. 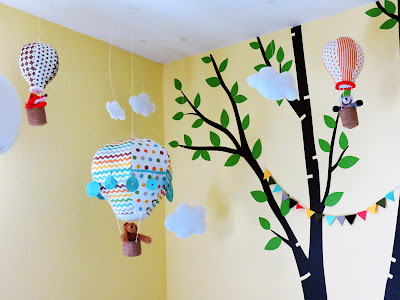 I took down all of the nursery's normal hot air balloons and replaced them with snowflakes. You don't have to go crazy, 3 in a corner gives the right affect without over crowding the rest of the decorations. I found both the large foam and smaller 3D cardstock snowflakes at Hobby Lobby in the seasonal craft section. I hung them from artisan wire, its easier to make loops to hang from the Command Hooks and looks better then string. I also found a card stock craft kit with reindeer and sleigh at Hobby Lobby or you could use Martha Stewart's holiday garland. In November, I saw a Facebook post from a friend who is an emerging children book author. When I saw the picture of books wrapped for a Christmas advent calendar I fell in love. I thought I would save the idea for next year, when my son was old enough to enjoy opening presents (he is only 2 months old now). I shared the post to my Facebook wall and my grandmother, who we call Baba in Ukrainian tradition, saw it and fell in love too. At a lunch we discussed it and she loved the idea, and would want to make 3 of them to give to all of her grand kids, but she felt it was too late to go and find all the books in time for 2013 Christmas. Boy was she wrong ;) I told her with Amazon, we could find all the books, even vintage used ones, and have them shipped in a week or 2, just in time for December 1st. We found Little Golden Books at Barnes & Noble, one of the last local brick-and-mortar book stores in our area, on sale as well as Amazon and Amazon Marketplace. Each book averaged around $4, the trick is to get multiple vintage books for 1 cent at one reseller at the Amazon Marketplace. We tried Friends of the Library stores and consignment sales but didn't find any Little Golden Books there, online is really your best bet. You can find collections and lots of them on eBay or Etsy, just be careful of the shipping costs. Here is a Amazon Collection of Christmas Little Golden Books. You can pick the best ones that fit your child's interests, like Barbie, Thomas or Veggie Tales. We decided to display and store the wrapped books in a box. You have to find a box that is about 1/2 inch wider and taller then the largest book to account for the wrapping. For Little Golden Books that is about 7x8x8 box. We found the perfect sized box at Container Store but you could also find similar shaped boxes at Hobby Lobby or even on Amazon. In the inside of the lid, Baba wrote a message to each grand child. We decorate my son's nursery for Christmas, replacing all of the regular books on display with Christmas books. So instead of keeping the books in the box, we just use the box for storage and display the wrapped books on the picture ledges we use as front facing book cases. It looks festive and will help him learn numbers trying to hunt for the right numbered label. Want to make it a multi-generational tradition? If you have multiple children in a family, once they grow up, divide the books up and buy new ones to build book advent calendars for their future families while still passing down books and the tradition. Find other ideas for Book Advent Calendars on Pinterest. 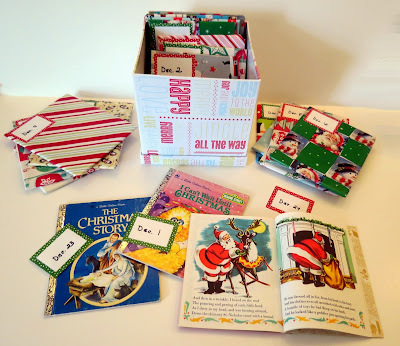 Since Baba was so generous in creating these three Christmas book advent calendars for her grand children's children, I wanted to gave her a thank you gift that she could wear and think of her far away great grand kids. 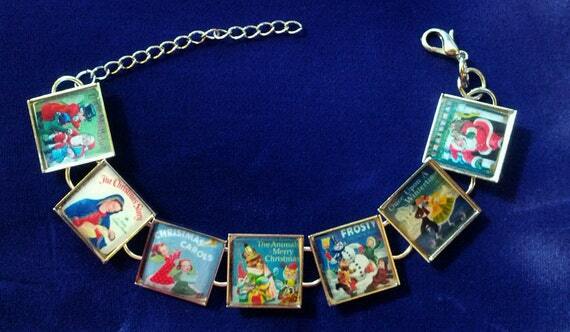 In my book searches on Etsy, I found a beautiful hand made bracelet with little pictures of the covers of Christmas Little Golden Books. It was perfect! When I gave it to Baba she cried, so happy knowing she can wear the bracelet and think of her grand kids reading the books and enjoying the holiday season. We are expecting a little baby boy soon and while my mother might have hosted my baby shower, I was the one who designed the decorations. 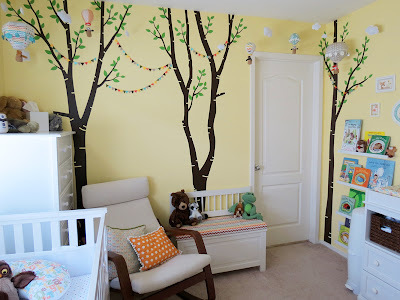 I wanted the theme to match our baby's nursery, Woodland Adventure, which you can see pictures of at this blog post. 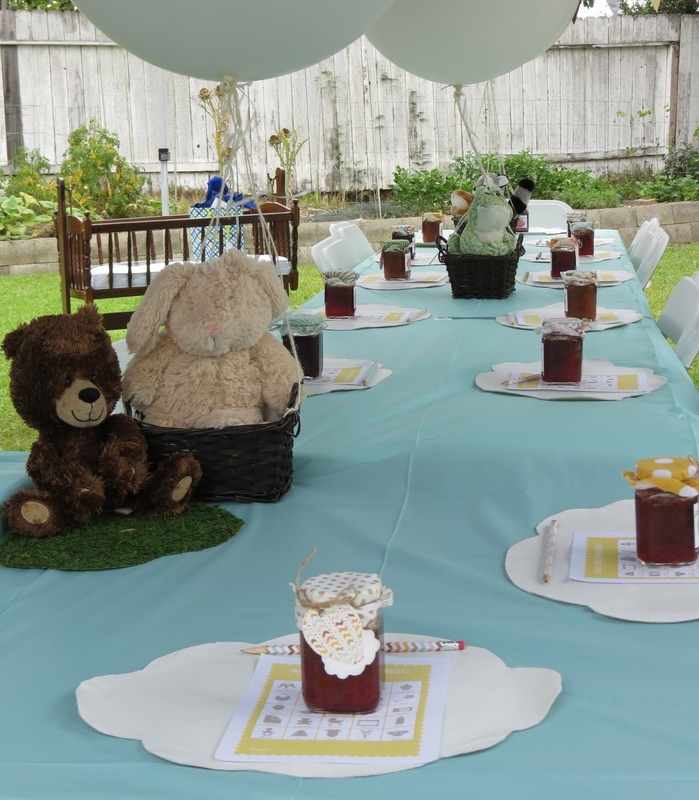 We decorated the tables with light aqua table clothes and baskets of stuffed animals with helium filled 'hot air' balloons. 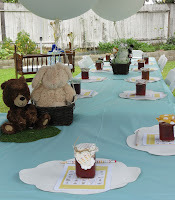 Each place setting was set with cloud shaped vinyl place mat, baby shower bingo paper, and favors. We designed cupcakes to match the theme of Woodland Adventure's forest animals and hot air balloons. 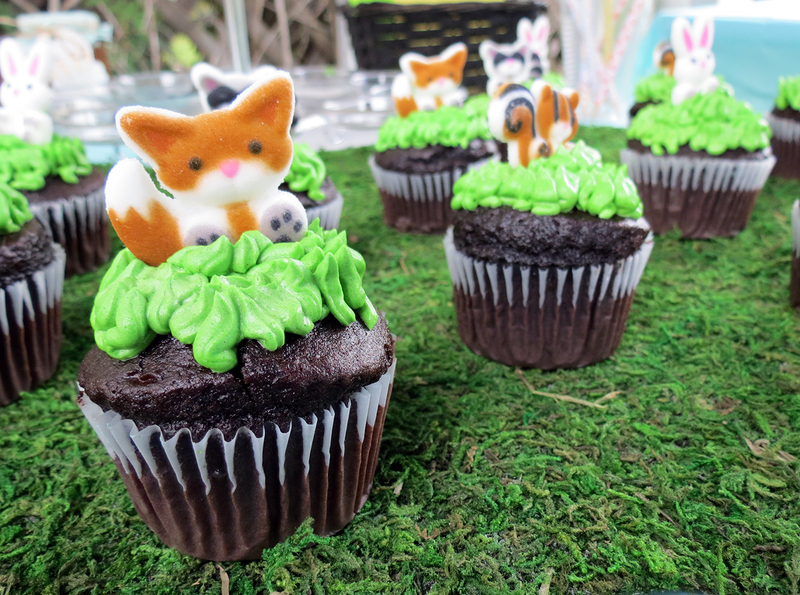 The animal cupcakes were chocolate with green icing piped out like grass with sugar animal decorations. 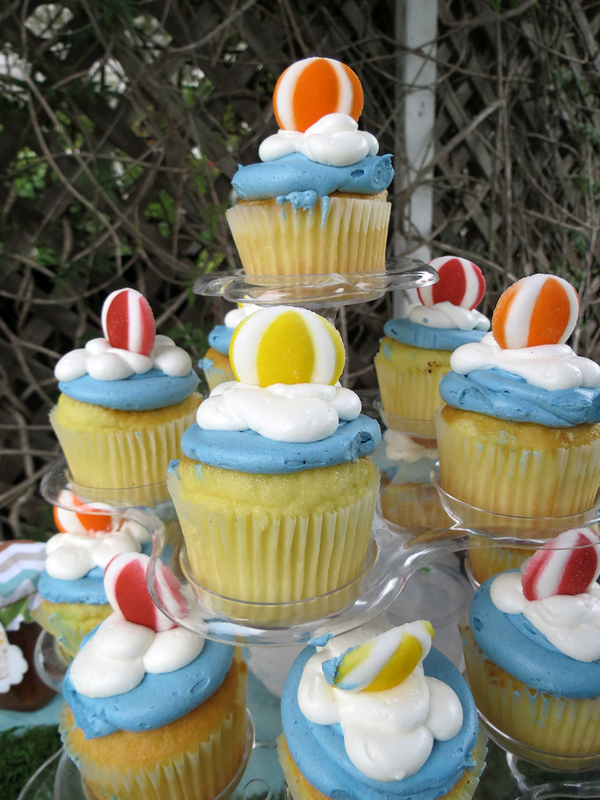 The hot air balloon cupcakes were lemon cake with sky and cloud icing and hot air balloon sugar decorations. 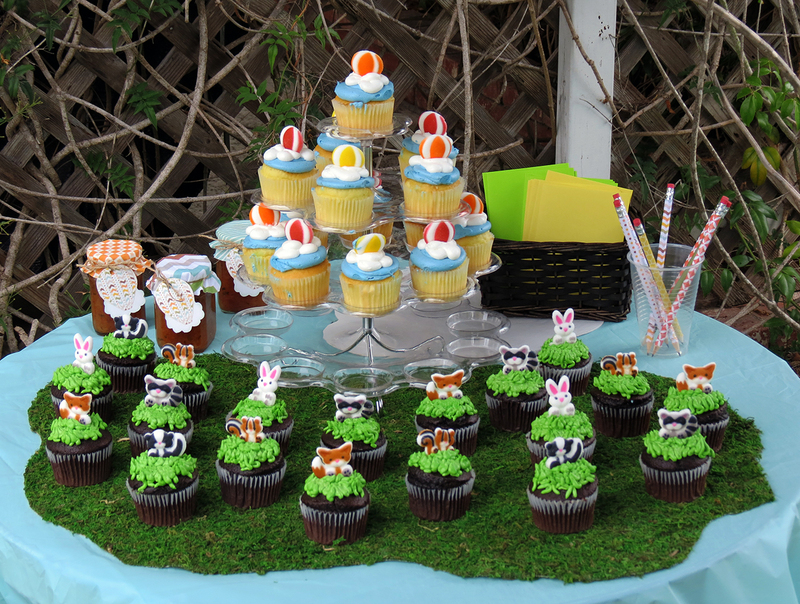 We placed the animal cupcakes on a moss mat on the table and placed all of the hot air balloon cupcakes on a clear cupcake stand to look like they were floating in the sky. While I was 'allowed' to do the decorations, my mother was adamant that she was responsible for the games. I've attended several baby showers and was concerned that the games would be too old-school for the modern couples shower I wanted. However, she came up with some great couple friendly games that everyone enjoyed! In teams of two, couples had to just use one hand each to diaper and fully dress a stuffed animal. Grandma won, but parents-to-be didn't fare too bad. It was great fun to see the different couples, with kids or without kids, dress the animal. Green Beans or Peas? Carrots or Yams? 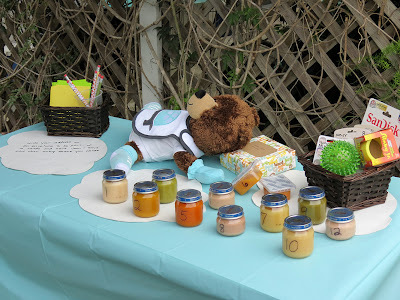 Remove the labels off of jars of baby food, number the jars, and have each person try to guess what the food is. Lots of fun with similar colored foods. Meats are especially hard. 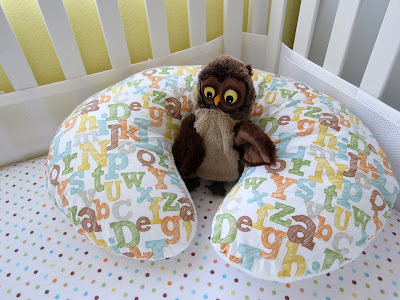 Make sure you keep the labels so you can reattach them and give them to the parents-to-be for use later. The most fun had at the couples shower was completing and reading pregnancy mad libs. Lines like "She was dilated 54 centimeters and the baby figure skated out" brought tears to the couples. You can write your own mad libs or find them online. Along with our usual gifts of home made jams, we also provided customized pencils for people to use during games and to take home. Simple wooden pencils covered with scrap booking paper or even just designs printed from your computer can look amazing! 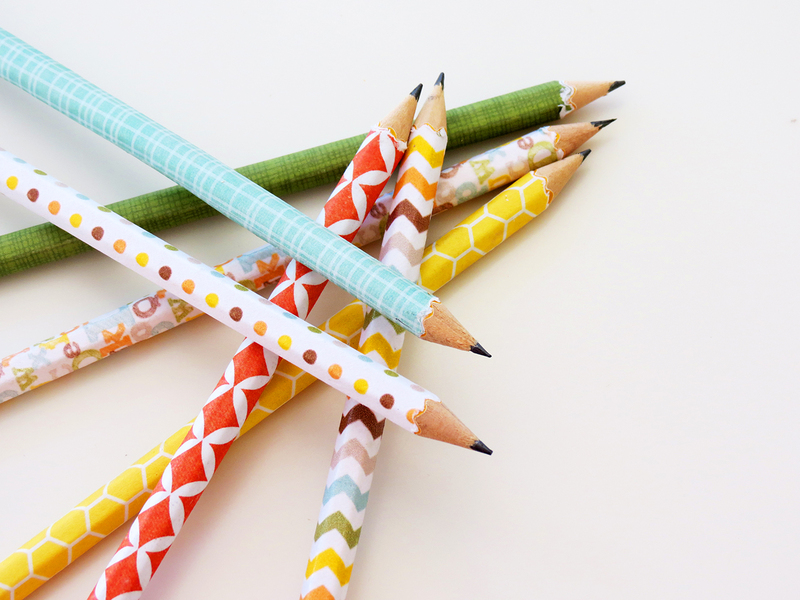 Cut your paper a little less then the length of your pencil and about half an inch wide. Add Mod Podge to the back of the paper, wrap it around the pencil and let dry for an hour or two. Be careful when sharpening the pencil, I was able to hand sharpen them but my battery powered sharpener couldn't handle both the pencil, paper and Mod Podge. 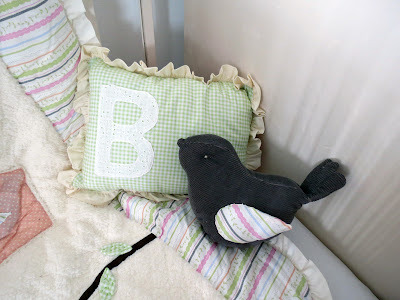 Being a 'professional nursery decorator', I thought designing my own nursery might be daunting for the mere fact that I love so many themes and fabrics. I started drawing designs and ideas from practically the moment I found out we were pregnant. 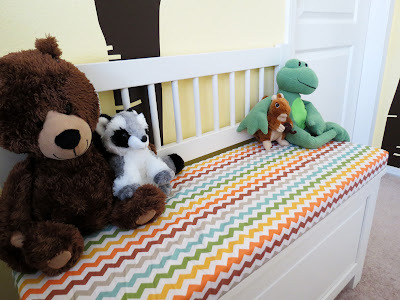 I spent a lot of time walking nursery areas of fabric and department stores, to see what was commercially available and what too-trendy themes I wanted to avoid. With just one extra room in the house (sorry kids, but this momma isn't giving up her design studio!) I wanted to make sure I designed a space that a baby could grow up in and even share with a future sibling so I didn't want a specifically boy, girl or baby theme. I also knew I wanted the room filled with vibrant modern colors and not so soft and pastel like so many nurseries are. Instead of trying to find the perfect matching colors at fabric stores, I decided to design all of my own fabrics and have them printed from Spoonflower.com. I was able to design modern prints like chevrons and alphabet in the exact color scheme I wanted for the nursery and open up a new product line for Creative Tradition at the same time. 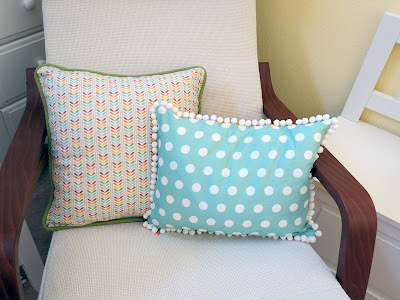 In the process, one of my fabric designs turned out to be the 2 Millionth design on their site! 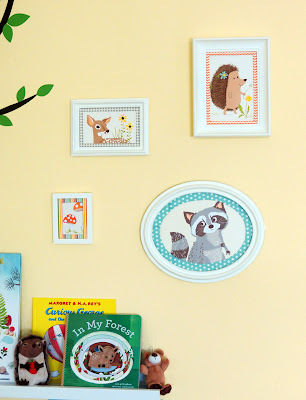 While managing our Creative Tradition Etsy online shop, I fell in love with some prints from SeaUrchinStudio that had a great woodland critters theme. 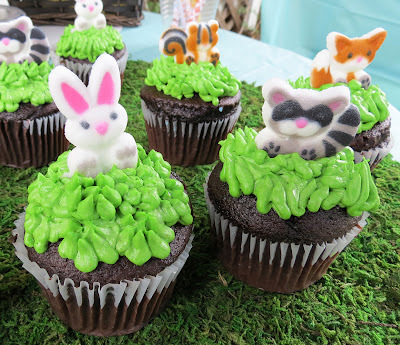 I specifically loved how the forest animals were cute but still realistic. So many of the animal themes available for nurseries are overly cartoonish. I also found a great wall decal of trees at SurfaceInspired's Etsy shop that I knew would look just great on our pale yellow walls. On the same wall we hung Ikea Ribba Picture Ledges to create open facing bookshelves. The picture ledges come in two different sizes and different finishes and just cost $10-$15 each. Wish we had more space to add more ledges, I just love how the book covers are all on display and bring so much color to the space. The picture ledges are also deep enough at 3.5" to hold diapering essentials like power, lotions, and even the new Huggie's Natural Care Resealable wipes. I removed the design from the stand up wipe tube and recovered it with my colorful chevron fabric. Several coats of Mod Podge will help keep it clean from its daily use. 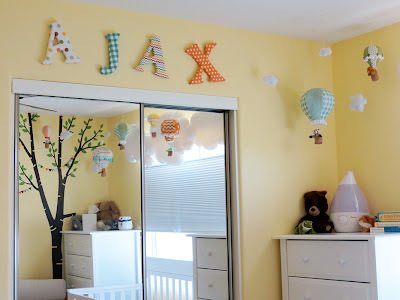 Even though we wanted a gender neutral nursery, once we found out we were having a boy I wanted to add a bit more 'daring' instead of 'darling' into the nursery design. At a craft show I was inspired and sketched out a hot air balloon quilt with forest animals riding in the basket. From there on out our theme was 'Woodland Adventure'. My hubby likes to consider it like 'Wind in the Willows' -- sweet forest animals, with a bit of daring adventure thrown in for good measure. 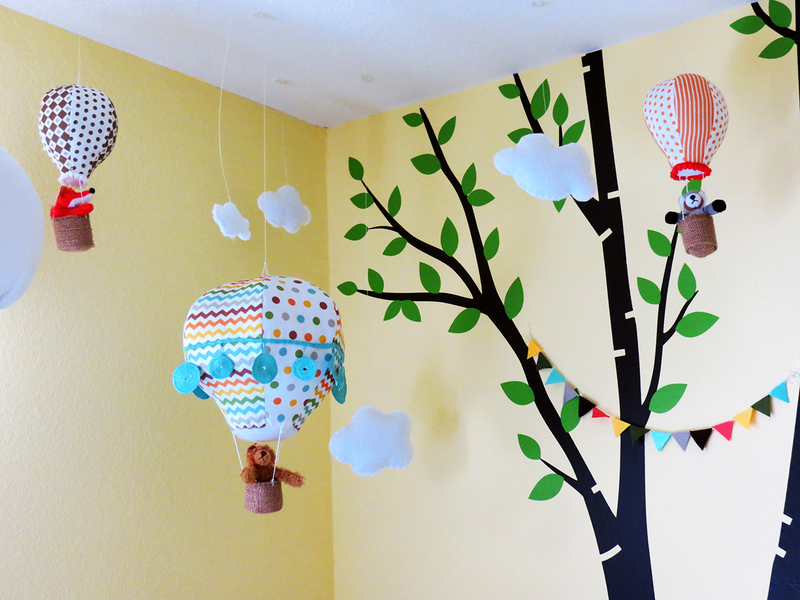 I found a great mobile pattern on Etsy at CraftSchmaft to make fabric hot air balloons to decorate the nursery. The pattern was easy to use and follow. As I wanted multiple sizes of balloons, I enlarged the pattern slightly to create the medium sized balloons. For the large balloons I didn't enlarge the pattern on a copier, but instead took the medium balloon pattern and added an extra half inch on all sides. This created a slightly different curve to the balloon that I find interesting. I also created all of my own cloud patterns to make them unique. 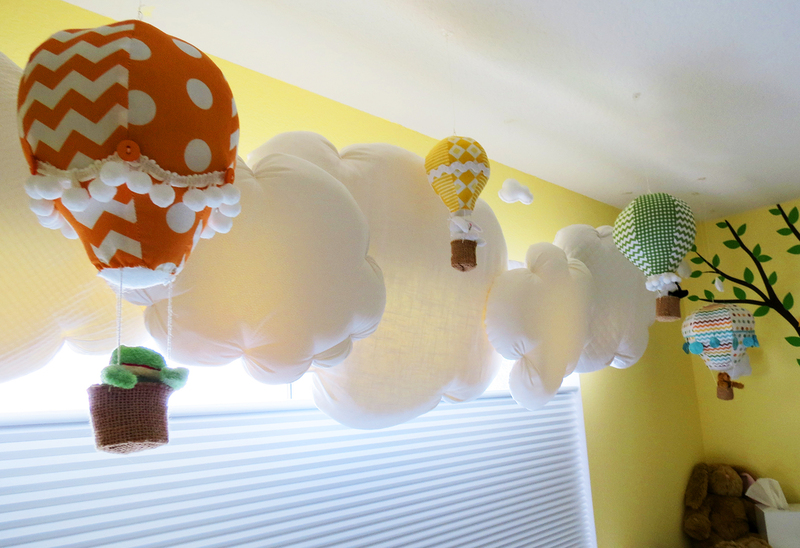 I hung all of the balloons using clear CommandStrip hooks and wire. 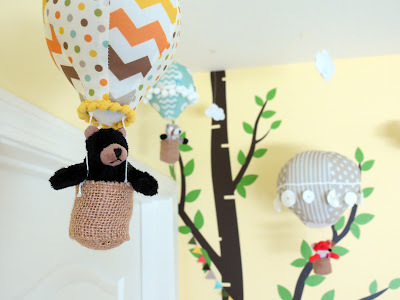 The wire was more sturdy then string or fishing line and provided a way to position the balloon and baskets in certain positions so they didn't spin and the animals in the basket looked the right way. The baskets were made from burlap ribbon scraps I had left over from our wedding floral arrangements and were the perfect size for the Only Hearts Pets mini stuffed animals to ride in. I created the window valance using chair foam sculpted into clouds and covered in different textured white fabrics. 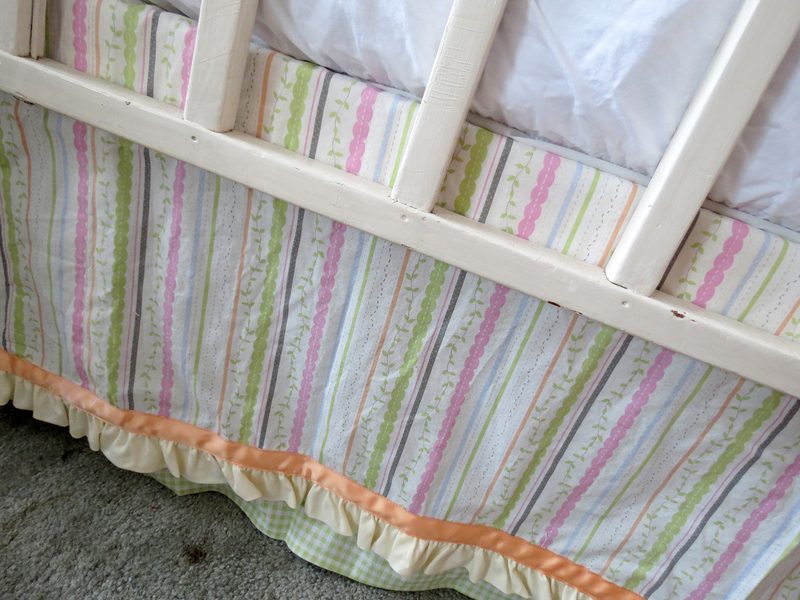 I took plenty of pictures while I made the valance and hope to provide a tutorial soon. I love how the light shines through and makes the clouds glow. The closet went through several different designs as the nursery progressed. Initially I wanted to turn the sliding doors into open facing bookcase to maximize the space. However as we got further along the more likely we would have structural problems led us to paint them with custom tinted chalkboard paint. While the color worked with the room, it just felt wrong, so we replaced the sliding doors with mirrored doors. The finished products looks wonderful! 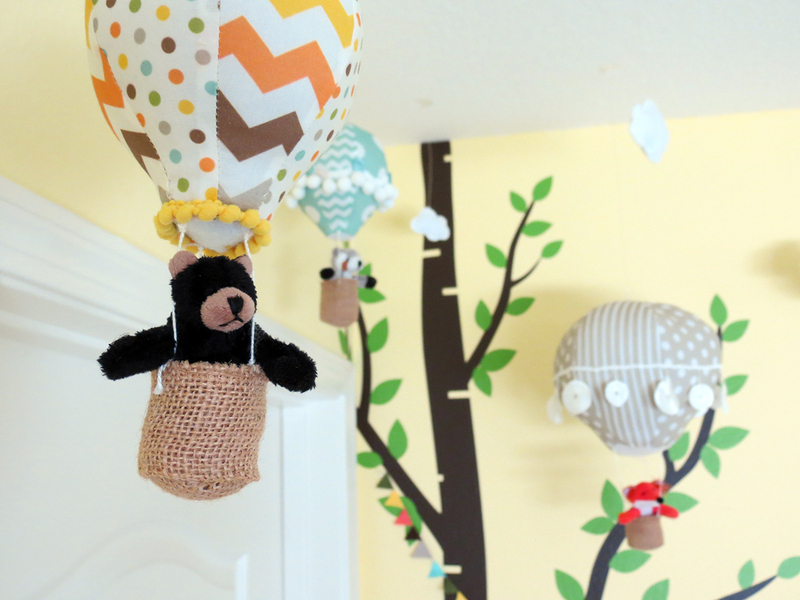 It opens the small room up, reflecting the tree wall decal and hot air balloons. 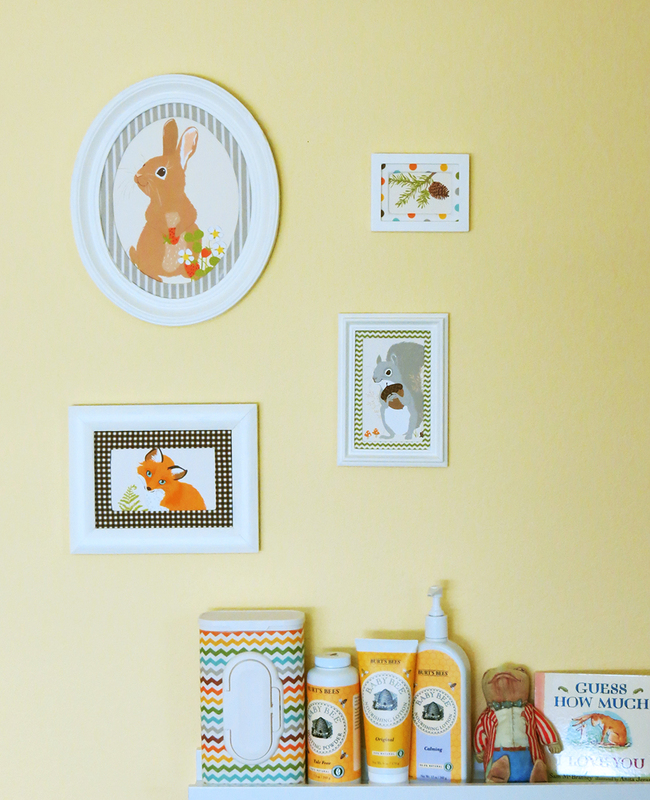 Finishing touches are what really makes a nursery come together. With my custom designed fabric, I made some of Creative Tradition's best selling products: nursing pillow covers, crib skirt, rocker pillows, toy chest seat covers, and contoured changing pad covers. Its been a long time since we've posted on our blog, but we've had a good excuse -- actually 2. Over the Christmas holidays we discovered that both my sister and I were pregnant! 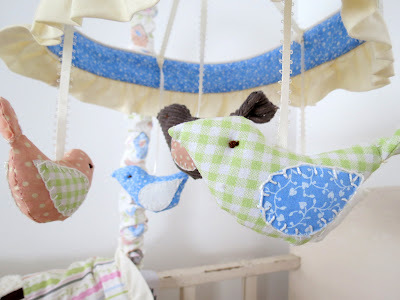 Since then its been a whirlwind of morning sickness, exhaustion, craft shows, and lots of baby sewing. At a random trip to the fabric store, I found a new nursery fabric that had birds and birdhouses on it. My sister wanted something less pink with blue so she could reuse a lot of her first child's, a baby boy, crib sheets and things. 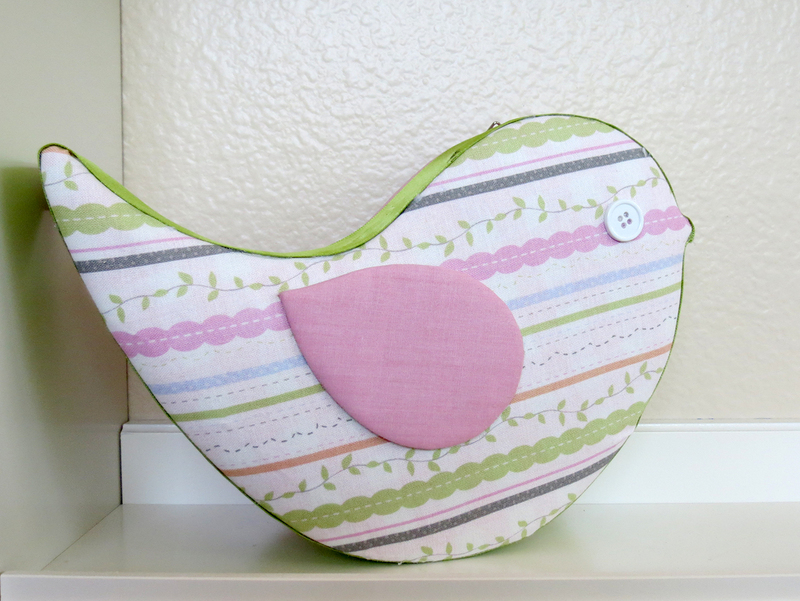 The birdhouse fabric had blue, green, peach, grey and pink. The perfect color scheme for her. 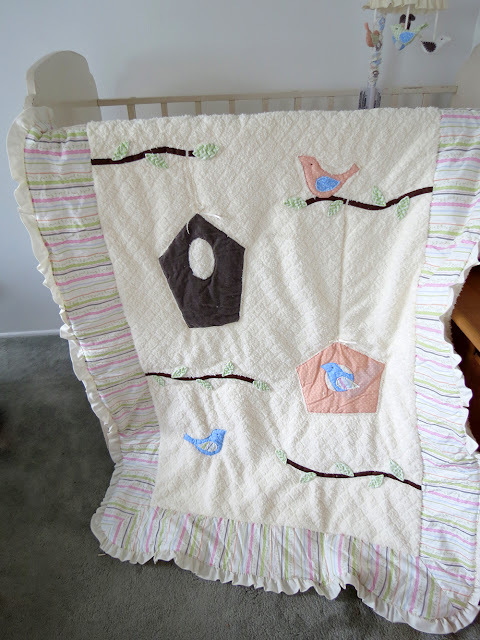 At first she said she didn't want much, just a quilt, but within a day or two her list had grown to include an entire nursery! It was fun to work on another baby girl's nursery while working on my son's gender neutral nursery. There is just something about cute ruffles and frills that are so fun to work with! 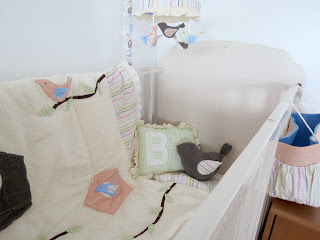 View our Baby Brooke's Birdhouse Nursery Pinterest board for more ideas how to recreate this nursery on your own. Over a year ago I converted my guest room into a design studio or craft room for my sewing, scrapbooking, painting and other creative pursuits. I updated it again to have more storage and now I've updated it again to help me take photographs of my handmade quilts. 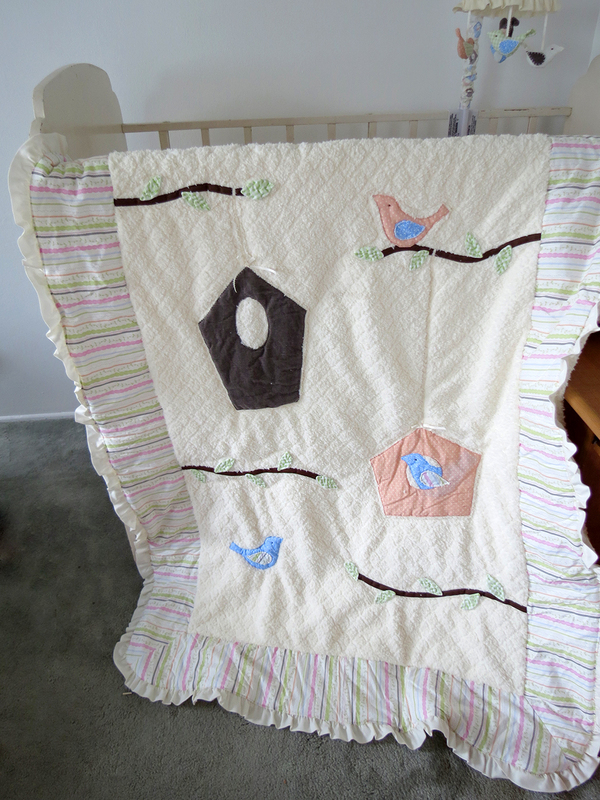 I've been using thumb tacks, push pins and even safety pins to hang my handmade baby quilts so I can photograph them for our Etsy store. This has left hundreds of holes in my wall and has caused my post production color issues as my wall is slightly pink. I can move my storage containers around, quickly and easily clip up a quilt and take pictures. When I'm not photographing quilts then I can put my storage containers back. While I mostly only use a small portion of the curtain rods and clips for the majority of our baby blankets, I got a curtain rod long enough to support a a king size quilt to show off my larger master pieces. With the white clips and rod I can more easily find true white when correcting the color of the pictures. I also added colorful, inspirational fabric in black frames to help provide more color to help the graphics program make better 'automatic' adjustments. As always, Thanksgiving was a special family gathering for us this year. It was just our immediate family and grand parents. We spent a lot of time talking, munching on olives, catching up on each other's lives -- new jobs, home projects, ideas about the world. Jeanine, my mom and the 'traditional' partner of Creative Tradition, spent most of the morning in the kitchen prepping and cooking. Thanksgiving is really her favorite holiday. She shows her family love through cooking and on Thanksgiving she really gets to shower us with food and love. She had the large bird in its bag, in its pan and in the oven before most of us arrived. The table was also dressed and ready with scraps of paper telling everyone what food went into what serving dish. While waiting for the turkey to cook we had an opportunity to Skype with our far away family. We got to watch my younger nephews playing, dancing, nearly walking, doing somersaults, having fun. Its nice to be able to connect with family across the miles. It may not be the same as having them in the same room with you but seeing smiles and hearing voices is a wonderful thing. As the time got closer to the meal everyone stepped up and helped in the kitchen stirring gravy, mashing potatoes, carving the turkey or really what ever mom asked of us. It made the kitchen a little tight to maneuver at times, especially with heavy, hot dishes but the feeling of family was palpable. My sister and I acted like the children we are in our hearts and stole little bits of food while mom chased after us with a wooden spoon. Despite the drama, hot plates, and MANY cooks in the kitchen the table got set, food was served and the family began the meal. Table set with side dishes, waiting for the carved turkey. © 2011 CreativeTradition.com. All Rights Reserved. Powered by Blogger.